There are three houses available for short-term stays on our vineyard, besides de main house. Each cottage has its own swimming pool, and the property is dotted with olive, fig, almond, and carob trees. 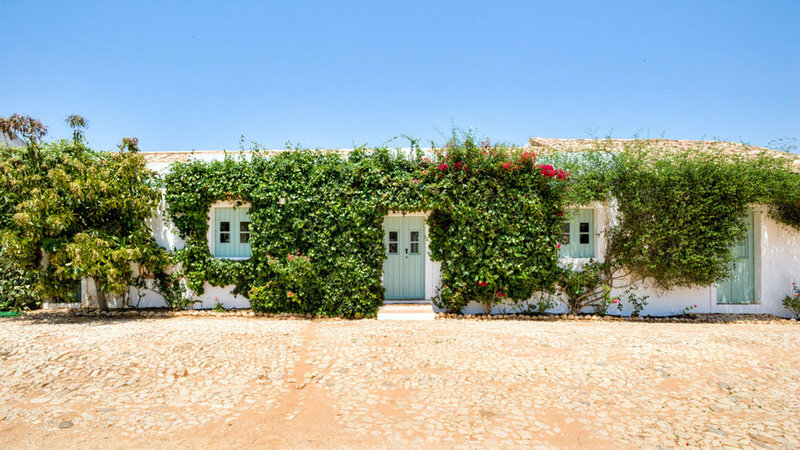 We're located in the Algarve, between Lagoa and Silves, about 15 minutes by car from some of the world’s best beaches, and each house is comfortably appointed for a relaxing stay. Click below for more information about the houses available to rent. It’s where all the action unfolds. It’s also the biggest house on the estate and is blessed by the presence of a 2.000 year-old olive tree. With large entertainment space and beautiful rooms as well as a large lawn and swimming pool, The Main House is a wonderful vacation or venue rental. It holds up to 12 people in 4 rooms, 3 of which have en-suite bathrooms. Once you enter, it’s on the right after a short drive. Painted white with old blue wooden doors and shutters, it’s surrounded by old olive trees. At the back—surprise—it’s your very own saltwater swimming pool. It holds 8 people in 3 rooms, 2 of which have en-suite bathrooms. Totally private. There’s something special about this house, with it’s gigantic living room, overlooking a small garden with it’s sheltered pool amidst orange and lemon trees. It overlooks the fig orchard and the distant Monchique mountains. A light and airy house amidst the old olive trees and the gorgeous Negramole vines. There is nowhere better to watch the sun go down than sitting in the oversized terrace facing the white beach-entry pool with a glass of Palhete ‘17 among a group of friends.